We take a group of people – from infants to pensioners, of any background, any culture – and together, we make ‘in the moment’ music! It’s is completely free of boundaries! Some musicians refer to this as ‘jamming’. 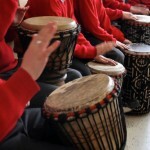 We use the beautiful drums and hand percussion instruments. The audience is your group – the participant is also an audience member so there is no need to feel in any way scared or self-conscious…in fact, the opposite will happen – we see it all the time! No musical knowledge or skill is required. All participants are equal. Through rhythm you make a connection. You are communicating at a level which you may not even realise! 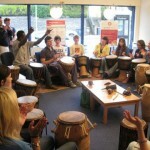 Participants are not learning through a set structure from a teacher, but are facilitated by a facilitator, on a musical journey of repetitive improvised rhythms. Similar to a metronome the facilitator will keep and encourage the movement to continue and will inspire – push along, if you will – the rhythm. 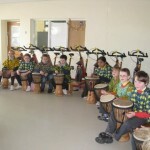 They also ‘push’ the rhythm into your – the group and its participants – control so that you each end up leading and passing without even realising. 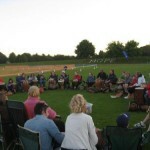 Sustaining a repetitive rhythm is known as rhythmic entrainment which has a calming effect on the physical body and an energising up lifting effect on the spirit, which in turn achieves a higher state of community and individual expression.